Pebble Partnership spokesperson Mike Heatwole gives a presentation on the Pebble mine project to Homer residents Tuesday. Pebble Limited Partnership held a public meeting in Homer Tuesday to offer area residents an opportunity to ask questions about the project. Residents raised concerns about everything from earthquakes to who’s responsible for the mine site long after Pebble ends the 20-year project. Pebble plans to start some survey work in the Anchor Point area next month, where it hopes to install a natural gas compressor station. The station would pump gas through an underwater pipeline to the mine site on the western side of Cook Inlet, providing power for facilities. Pebble spokesperson Mike Heatwole told residents that work would aid the permitting process and was the impetus for the meeting. He also tried to address several concerns about the project, namely the impact it could have on Bristol Bay fisheries. The tailing dam failure at the Mount Polly mine in 2014 was heavy on several people’s minds at the meeting. The disaster sent millions of gallons of mining waste into central British Columbia waterways, and naturally, how Pebble plans to store its waste-rock was a large topic of discussion. Pebble Vice President of Permitting James Fueg told residents that Pebble would build two separate tailing dams, one for bulk tailings and one for pyritic material, which can produce harmful acid when exposed to oxygen. Fueg two water treatment facilities would helped Pebble manage water at the site. He added that the project is being designed to handle both short-term flood and long-term rain events. “We’re not just looking at one year, we’re not just looking at one storm, we’re looking at the maximum amount of water you can have over an extended period throughout the mine life,” he explained. Other residents raised concerns about what happens when the 20-year project is completed. Fueg explained that Pebble plans to dismantle the tailing dam filled with the pyritic material and use it to fill in the open pit mine site. He added that an “impermeable cover” would be placed on the bulk-tailing dam, which would remain on site. One of the water treatment plants would also remain to treat water draining off the dam. “What happens when you guys are gone and the treatment plant malfunctions?” one man asked. Fueg responded by explaining that Pebble would need to provide funding for the mines closure through a bond that would build throughout the mine’s life. Fueg said that money will pay for both closing the site and managing all remaining facilities after the project is finished. That pool of money would be managed by the state. The state would also assess its growth every five years, making sure there’s enough funds to manage the site into the future. Residents raised a number of other concerns during the hour-and-a-half long meeting, mainly whether Pebble plans to expand the life of the mine if it receives the necessary permits to operate. Heatwole said Pebble has no plans to increase the size of the mine or extend its life. He reminded residents that others could apply to take over the mine, but they too would go through an extensive permitting process. The permitting process for Pebble is expected to last through mid-2020. The U.S. Army Corps of Engineers is taking comments on the recently released Draft Environmental Impact Statement until May 30. The Army Corps will also accepting public comment during a meeting in Homer on April 11. The U.S. Army Corps of Engineers will close the commenting period of its scoping process for the Pebble Mine Project Friday evening. As the last of the comments trickle in, some critics of the mine are taking issue with some changes that were made during the scoping period. The comments the Army Corps of Engineers collected from the public will set the stage for what it will study as it compiles the Environmental Impact Statement. As the scoping process for the Pebble Mine moves forward, Cook Inletkeeper is hosting several workshops in Homer in an effort to broaden public comments given to the Army Corps of Engineers. 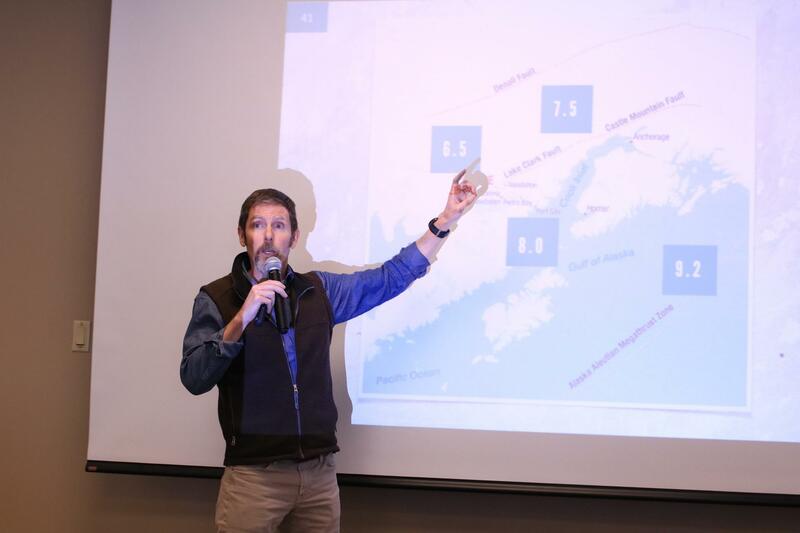 Inletkeeper held a session Monday about how Pebble’s infrastructure may affect bears on the western side of Cook Inlet. Bear viewing operations, biologists and others from the tourism industry fear the project would lead to population declines in the area. The discussion around the proposed Pebble Mine in Southwestern Alaska has primarily been focused on Bristol Bay. But the effect the project will have on Cook Inlet and Homer is still unclear. The Army Corps of Engineers is preparing an environmental impact statement analyzing the impacts of Pebble Limited Partnership’s proposal. They will gather input on what to include in the EIS from the public during several scoping sessions throughout April. Homer environmentalists want to make sure the Corps studies any potential implications for the Homer area.